While the exact cause of Morton's neuroma is unknown, the growth of the neuroma seems to occur in response to injury, pressure or irritation to one of the nerves that lead to the toes. 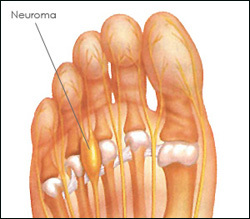 People with certain foot deformities - bunions, hammertoes and flatfeet- are at higher risk for developing a neuroma. Women are also more likely to develop this condition as wearing high-heels or narrow-toed shoes can increase pressure on the toes. Other potential causes are activities that involve repetitive irritation to the ball of the foot, such as running. Morton's neuroma can make walking and performing normal activities difficult and painful. Treatment options vary with the severity of each neuroma, and identifying the neuroma in its earliest stage of development is important to avoid more invasive treatments or surgical correction. Left untreated, neuromas tend to worsen, so it's always best to visit our Saginaw office at the first sign of pain. In the most severe cases, surgery may be recommended for patients who do not respond to conservative treatments. Diabetic Foot Center of Mid Michigan can help you determine the best approach for your specific condition.